This guide shows you how to set up Android File Transfer for files and folders that contain pictures, videos, and literally any other file on your Android phone. We explain the three fastest, easiest Android file transfer methods – starting with the easiest first. Method #1) Plug your Android phone into a PC with a USB cable. If your Android asks “how” you’d like to connect your phone to your PC, choose the option that most closely resembles “Media / storage”. After your PC recognizes your Android devices’s storage as being plugged in, use your computer’s File Manager (i.e. Windows Explorer) to copy and paste files from your Android device to your computer’s hard drive (or desktop – same thing, essentially). Method #2) Alternatively, you can use the app called WiFi File Transfer. This app makes a virtual file server on your Android phone and tells you the address, which you then enter into your computer’s browser. The WiFi File Transfer app method works quite well. If you use it, just make sure you PC’s hard drive has more than enough room to download your phone’s files, because the browser interface doesn’t seem to allow you to choose the download destination folder (and didn’t want to work when I set Chrome’s download directory to my External hard drive). Method #3) As a second alternative to plugging your phone directly into your PC, you can use an app called Bluetooth File Transfer. This method requires that you have a second device which has Bluetooth and is capable of sending and receiving files. Most smartphones, most tablets, and only some PCs have Bluetooth functionality built-in. I would only use this is the USB cord method and the WiFi File Transfer method don’t work. Bonus Method #4) If you have a USB On-The-Go cable (aka “OTG Adapter”, [easyazon_link identifier=”B00LN3LQKQ” locale=”US” tag=”arizonacaorg-20″]$10 on Amazon[/easyazon_link]) or if your phone has an external memory card slot, you can get a Micro SD memory card (which is perfect for smartphones that have an external memory card slot) for [easyazon_link identifier=”B00IVPU786″ locale=”US” tag=”arizonacaorg-20″]$10 from Amazon[/easyazon_link] and use your phone’s “My Files” or “File Manager” app to transfer files directly to the Micro SD memory card. This is typically the simplest way to transfer files to and from Android. As long as you have a laptop or computer and a USB cable that’ll connect your Android to your PC, then your PC should see the Android device’s storage as a “readable” external drive. Basically it should see the Android phone’s memory like it’s a thumb drive plugged into your laptop / PC. The one thing that may get in your way is that some Androids require you to select “USB Storage Mode” (or something similar) on the Android device after you plug it into the PC. 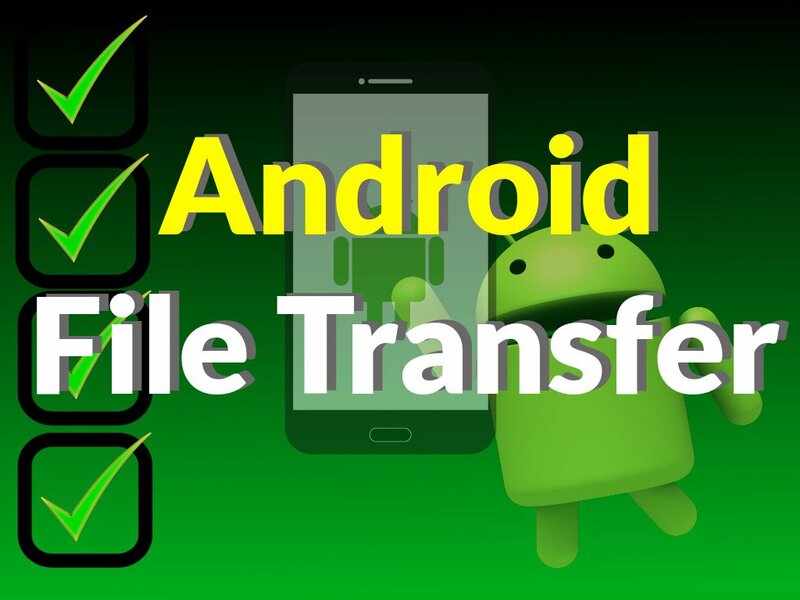 The WiFi Android transfer method is another super-easy way to transfer files from an Android. This method uses the free “WiFi File Transfer” app to set up an HTTP / FTP server on your Android device. This makes it so you can wirelessly access your Android storage using your PC’s browser. After you set up the WiFi File Transfer app on your Android, the app will display an HTTP address on your Android’s screen. Just enter this HTTP address into your PC’s browser to start browsing the files on your Android phone – then download files and/or folder individually or several at a time. The Bluetooth method for transferring files to / from Android is similar to the WiFi File transfer method, because you install a free Bluetooth File Transfer app on your Android. The part that’s different, though, is that you’ll need a second device that is Bluetooth-capable – such as another Android device. Basically, this method is good if you have two Androids. You can set up Bluetooth File Transfer app for free on both Androids – then use the app to transfer files between the two. Only some Android smartphones have memory card slots. This is one big factor that sets Android smartphone above iPhones: the ability to handle external memory. So, take advantage of this if your Android smartphone does have an external memory card slot. If it does, get a Micro SD card for about $10 from Amazon, stick it into your phone, and use a File Manager app (such as the built-in “My Files” Android app) to copy and paste files from your Android to your memory card. After that, copying the files to a PC is as simple as inserting the memory card into a PC memory card reader ($5 on Amazon). Then copy and paste the files from the memory card to your PC using your PC’s file manager. Done! Don’t hesitate to ask questions or say hi on the KFire YouTube channel! We do our best to respond quickly.